All animals interpret their environment through a complex mingling of information filtered through their five senses: sight, hearing, smell, touch, and taste. What separates one species from another is the degree to which each of these senses is used. Humans, for example, depend primarily on sight to interpret their environment; a dog, on the other hand, relies heavily on her sense of smell. To fully comprehend a dog’s life experience, a person must be willing to look at their environment and daily sensory stimulation from their dog’s perspective. The human eye is built around the same general design as the dog’s eye: Both contain cornea, pupil, lens, and retina. Still, major differences between them affect how images are perceived. People rely on their visual sense to interpret incoming information about the world, and our brains use more space and more neurons to process visual information than they do for any other sense. Dogs do not process images this way; for them the world is more of an off-colored and blurred landscape. A dog’s primary use of sight is to process motion, a skill vital to their ancestors’ survival. Dependent on the sustenance of hunted game, their eyes evolved into sharp motion detectors. You’re most likely to see this skill activated when a dog follows the trajectory of a toy or chases other animals. Though some dogs are hand shy as a result of being hit, many dogs veer away from the hand for another reason, namely their evolutionary instinct to avoid sudden approach or attack. The sight of a human approaching straight on, tone high pitched, eyes wide open and glaring, often sets a dog’s reactionary impulses in motion. Even a hand suddenly reaching to pat a dog may spell hesitation or withdrawal. When you first approach a dog, she’ll be unable to reason your intentions. Speak to the person at the end of her leash first, and if she says that the dog’s friendly, kneel down and extend your hand at her nose level. If she turns her head away, respect her and back off. If she sniffs it, you may pet her from the side or just beneath her line of vision. If your dog is suffering hand shyness, offer her a spoonful of a lickable reward or canned food with one hand as you reach repetitively with your other hand to pat her head. Do you have a small dog that backs away from your approach? Do not keep following her: You’ll look like a predator! Shake a treat cup or toy as you kneel down and encourage her to come to you. And please, no matter how frustrated you may feel with your dog’s behavior, don’t run after your dog to catch her. She will run, not out of disrespect, but out of sheer panic. The light of her life, the one she turns to for reason, is now the one hunting her. Flip to Part IV to discover a healthier approach to problem solving. If you’d like to speed up your dog’s learning process, add signals with a broad motion component to your verbal directions (see Happy Training, Happy Tails). These hand cues increase your dog’s visual attention to you and align with her species-engrained impulse to watch a leader figure for instruction. One of the things that people seem to be most curious about when it comes to what their dog can see is whether their pup can see colors. The simple answer that scientists give, namely that dogs are colorblind, is usually misinterpreted as meaning that dogs see no color but only shades of gray. This assumption is wrong. Colorblindness, to the scientist, means that at least one of the three color receptors found in the normal eye (we have red, green, and blue receiving cones) isn’t working. 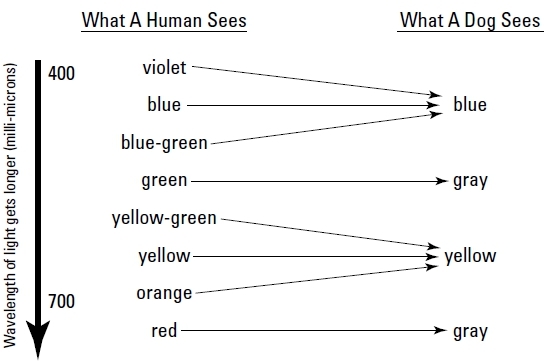 Thus, with only two functioning color systems, an individual can still see colors, but the range is limited, and he confuses certain colors that a normal person can perceive as distinct. This situation is the same with dogs. They do see colors, and they see them well enough to help guide their behaviors. However, the colors they see are neither as rich nor as many as those seen by humans. Figure 7-1 shows what a human sees when looking at a rainbow or a color spectrum and also what a dog sees. Instead of seeing the rainbow as violet, blue, blue-green, green, yellow, orange, and red, a dog would see it as dark blue, light blue, gray, light yellow, darker yellow (sort of brown), and very dark gray. To put it simply, in addition to gray, black, and white, dogs see the colors of the world as basically yellow and blue. They see violet, blue, and a cool bluegreen as blue; greenish hues as gray; warm yellow-green, yellow, and orange as yellow; and red as shades of gray. Figure 7-1: The colors a human and a dog see when viewing a rainbow. Three attributes of the canine eye allow for clear vision after dark. The most recognizable is the dog’s pupil, which is much larger than a human’s. Because the pupil is the opening that lets light into the eye, the big pupil gives the dog better light-gathering ability. Still, this skill doesn’t come without a cost. The wide pupil prevents clear focusing on images and objects, and depending upon their distance, they may appear blurry: A smaller pupil is needed to have good depth of field. Walk into any pet store, and you may be immediately drawn to a vibrant orangecolored object. These brightly colored toys (the color of a utility cone) are becoming increasing popular, although for reasons you may not have imagined. You see, unless a dog watches the trajectory of the thrown toy, he may run right by it, and though he may find it by using his nose, he is often puzzled why he can’t see it. The reason is quite simple. For the dog, the bright orange color of the toy is seen as nearly the same grayish color as the green grass on which the toy landed. In other words, it becomes virtually invisible to your pup! The designers of these toys are clearly concerned about whether the dog’s owner can find the toy easily in the store, rather than whether the dog can see it clearly on the grass! The other aspect of a dog’s eye that allows for a wide field of vision depends upon optics. The dog has a bigger cornea (the clear part of the eye that bulges out), which allows the collection of more light. The dog also has a larger lens, which gathers the light from the cornea and focuses the images that enter the eye. Together these optical components collect more light and allow better night vision than is found in the human eye. Ever wondered why your dog’s eyes reflect in the night, especially when flashed by oncoming headlights or when spotted by a flashlight? The effect comes from a component of the eye called the reflecting tapetum. This mirrorlike surface is located behind the retina, reflects light not yet absorbed by the light receptor cells, and gives the light-collecting cells in the retina a second chance at responding to faint images. Try this little experiment to discover how different life looks from the eyes of your dog. Smear a face-sized piece of cellophane with a light coating of petroleum jelly and look around. Although you can still make out the general outlines of objects, a lot of the smaller details are blurred and perhaps even lost. What about vision on the move? Dogs have one visual advantage over humans: They can see moving objects better and faster than we can. This particular skill is obviously an evolutionary advantage for a hunter who has to detect his prey and run it down. One study of 14 police dogs found that the dogs could recognize an object when it was moving even at a distance of over a half a mile, but if that same object was stationary and much closer, they had much more difficulty identifying it. A dog’s heightened sensitivity to motion explains why some dogs like to watch TV. The motion elicits their predatory instincts and causes many dogs (especially hounds and terriers) to jump up and respond any time a vehicle or animal races across the screen. Your dog’s sense of hearing is actually more important to her than her eyesight. Though she relies on sight for locating and allowing the grabbing of a moving object, she determines the identity and relative location of objects by sounds coming from them. Wild canines with pricked ears can move them to help determine the location and direction of sounds. Meanwhile, the changes in sound qualities traveling through the air and deflecting around the ear flap can help precisely determine the distance away of their prey or other pack members. A person’s and dog’s hearing capacities are quite different. While most people believe that dogs have better hearing than humans, it’s not the case for all sounds. Rather, the dog’s advantage is in her capacity to respond to a far broader range of auditory experiences. To fully grasp the difference in auditory perceptions, it’s helpful to understand how a noise is recognized by the brain. The noises that enter the ear can be described as waves: The lower the pitch of the sound, the lower the frequency of the sound pressure peaks that hit the ear; the higher the pitch, the greater the frequency of the wave’s undulations. The pitch of a sound (high versus low notes) is indicated in a measurement known in professional circles as a Hertz, or Hz, and it’s really nothing more than the number of sound pressure peaks that hit the ear in a second. Sounds that are important for understanding human speech range from about 500 to 4,000 Hz, and humans have ears with their peak sensitivity in that range. Dogs’ hearing isn’t any better than humans for these sounds. The highest notes that a human can hear are around 20,000 Hz. Many of the animals that were hunted by the dog’s wild ancestors evolved a set of behaviors to take advantage of their visual limitation. Specifically, when being pursued, the prey animals would simply freeze in place. Because of a canine’s lack of visual acuity, when something is motionless, it becomes virtually invisible. Try this one out on your dog. Stand very still at a distance of around 20 feet and see whether your dog responds to you. Remember, the moment you move, the game is over. Dogs, on the other hand, evolved from a species that hunted for survival. Thus, their hearing had to be sensitive to the highpitched sounds of animals rustling in the leaves and brush and emitting scrabbling noises in hidden spaces. For this reason, the hearing range of dogs extends to much higher frequencies than our own, to between 47,000 Hz and 60,000 Hz, depending on the breed and the conformation of a given dog’s ears. It’s not that dogs have better hearing sensitivity than humans do; it’s simply that they can hear higher frequency sounds than people can, which gives them a much broader range of hearing. Recently, an accurate measure of a dog’s hearing capacity was made possible by the development of a hearing test known as Brainstem Auditory Evoked Response (BAER). BAER measures the electrical activity in the inner ear and in the neural pathways that send sound information to the brain. With small electrodes attached to a dog’s head, short bursts of sound were put into her ear, and her brain’s response was recorded by a computer. Calling all cat lovers. This mighty hunter, whose entire sustenance may depend upon small rodents that make squeaky sounds, can hear sounds that are 5,000 to 10,000 Hertz higher than can dogs. Some dogs are born with a predisposition toward poor hearing or deafness. Research done at Louisiana State University in Baton Rouge involving nearly 17,000 dogs showed that it’s the dog’s coat color that is associated with congenital deafness. The genetic defect that produces deafness is closely linked with the genes that produce coats that are white, roan (a dark color coat that has been liberally sprinkled with white), and piebald (spotty, especially black and white) colors in dogs. Just as coat color makes a difference, eye color also can indicate the likelihood of deafness in some breeds. Dogs with blue eyes are more likely to be susceptible to congenital deafness. For example, in Dalmatians with blue eyes, the rates of deafness can run up to 50 percent. For this reason, some kennel clubs (such as those in Canada) try to discourage the breeding of blue-eyed Dalmatians by barring them from the dog show ring. The classic example of a piebald dog is the Dalmatian. In this breed, 22 percent are deaf in one ear, and 8 percent are deaf in both ears, amounting to an amazing 30 percent born with some form of hearing deficit. In some breeds of dogs, the white, roan, or piebald genes are found in certain individuals, but not others. For example, a Bull Terrier can be either white or have prominent color patches. Among those Bull Terriers who are white, the rate of congenital deafness is 20 percent, while for those with color patches, it’s only around 1 percent. Table 7-1 shows common breeds of dogs that are likely to have congenital deafness either in one or both ears. The problem usually becomes apparent in the first month or two of the dog’s life. Odd as it seems, deafness in a dog can often go unnoticed by its owner. One of the authors of this book had a Cavalier King Charles Spaniel named Wiz who had become quite deaf, yet visitors seldom noticed because he was always present to greet arriving people and always showed up when the other dogs in the house were called for a treat. The trick was that he was living with two other dogs who bustled around actively. Seeing and feeling their movements gave him enough information to know what was going on without his actually being able to hear human sounds. Often the first sign of hearing impairment in a dog is subtle — it shows up as an inability to locate sounds accurately. For example, your dog may act confused when you call her, and she can’t see you. She may look around uncertainly and come to you only when she finally lays eyes on you. Or you may notice that when a loud noise occurs, she swings her head first to the wrong side, away from the direction that the sound occurred, or acts confused as to where the sound came from. Sometimes, this loss of ability to locate sounds is an indication that your dog has lost hearing in only one ear, and that her other is still functioning. However, it may indicate a more general loss of hearing. To test your dog’s hearing accuracy, stand behind her and out of sight and then either squeak a toy, whistle, or bang two pots. (Make sure that you’re out of sight and that your dog is unaware of your presence.) A normal dog pricks its ears or turns its head or body toward the source of the sound. A newborn puppy is unable to process sound and, in fact, relies on touch and heat sensors to locate its mother. At three weeks of age, a puppy’s ears open, although nearly another month is needed for her to develop mature auditory sensors. When testing for diminished auditory perception, delay any hearing tests until the pup is at least six weeks of age for the sake of accuracy. The reason why dogs (and humans) tend to lose their hearing with increasing age is due to prolonged exposure to loud sounds. Deep in the inner ear, in a structure called the cochlea, tiny hair cells flex to register the arrival of sounds. Unfortunately, exposure to loud sounds can cause these hairs to break. Once damaged, a hair cell doesn’t grow back, so for each hair cell lost, an animal’s hearing ability is diminished. Some breeds seem to be more predisposed to the deafness associated with aging than others, particularly hunting dogs, such as retrievers. Though a sensible hunter wears ear protection to prevent the damaging sounds of gun shots to his own ears, the same isn’t provided for the dog, and we now know that the sounds of gunshots can contribute to the late-life loss of hearing in working hunting dogs. Though the size of this surface varies with the size and length of the dog’s nose, even flat-nosed breeds can detect smells far better than people. 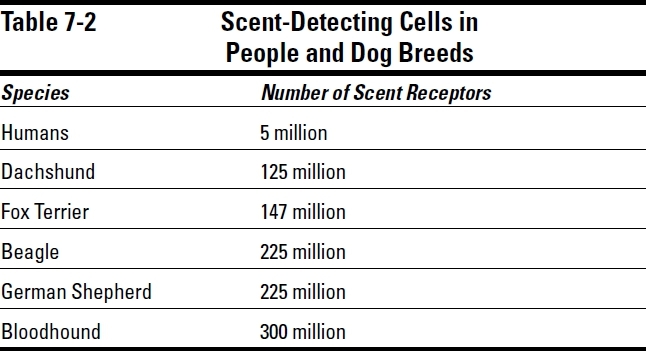 Table 7-2 shows the number of scent receptors in people and several dog breeds. Telling by scent when an animal has ovulated, which is useful for dairy farmers because cows have such a short period in which they’re fertile and can breed. Recent evidence shows that dogs can detect cancer by scent. Dogs have been reliably trained to find melanoma-type cancers and are able to do so much earlier than other methods can diagnose it. Current research is being done to see whether bladder and prostate cancer can be detected by having the dogs sniff urine samples, and whether lung cancer can be detected by having dogs sniff a person’s exhaled air. Finally, some dogs are very sensitive to human moods and can be trained to pick up the scent changes associated with human emotions. This skill allows them to be very good at assisting psychotherapists and to assist police in detecting when a person is lying. Research on this issue is continuing, but there is a suggestion that dogs may actually be more reliable lie-detectors than the commonly used electronic apparatus.